This angelic little creation winged her way all the way from the forests of Finland! Packaged as a flat, easy-to-mail 3½"x5½" postcard (and shrink-wrapped to keep everything in place), the 100% natural wood pieces pop out and fit together perfectly without glue or tools (illustrated instructions included). Recipients can display the sweet 2¼"- tall sculpture as a table decoration or attach the included string and hang it as a Christmas tree ornament. 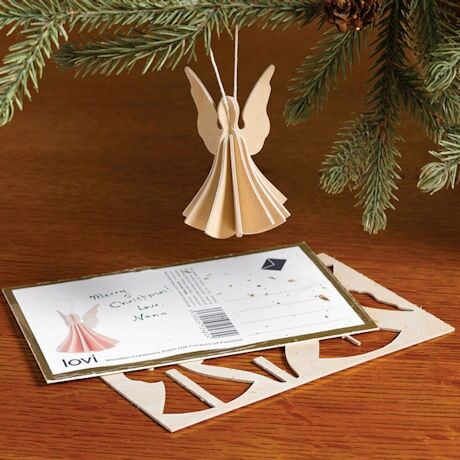 Lovi, the eco-friendly company who makes these elegant holiday missives, has planted 40,000 trees in Finnish forests (where they harvest wood for their unique goods) since 2009. Joy to the world!